Its clear to comprehend that Ezekiel’s writing and visions were apocalyptic and eschatological in nature—very similar to the writings found in both Daniel and Revelation. Ezekiel's vision speak of the appearance of God and his "Movable Throne chariot" on Earth. As further evidence of this fact, at the end of Ezekiel 1, after describing “a likeness with the appearance of a man” on a throne, Ezekiel wrote: “This was the appearance of the likeness of the glory of the Lord” (1:28), and "Then the glory of the Lord went up from the cherub" (10:4). We also see God riding the Cherub in Psalm 18:10 "And he rode upon a cherub, and did fly: yea, he did fly upon the wings of the wind." A thorough evaluation of Ezekiel's Vision of the Throne, one will realize it doesn't correspond with John's Vision of the "THRONE OF GOD" but rather with Daniel. For instant, Ezekiel describes a person navigating a movable object carrying the Lord. Whereas in John's vision, God is sitting on a "STILL THRONE" that is surrounded by a "RAINBOW" which is emerald in color. This can also symbolize Imperial Ethiopia and His Majesty's Royal Lion of Judah Emblem. Note: Blue Nile Falls in Ethiopia is popular for its extraordinary beauty and cultural worth. This is one of the most awe aspiring views of Africa where millions of gallons of water flow over the face of the cliff and into the ravine creating a spectacular RAINBOW. When water continues dropping, this creates a smoke like bounce of water droplets. Viewing the cascading water is indeed a spectacular occasion. Therefore, Bob Marley dubbed Ethiopia in one of his song, "Rainbow Country"
"John (Book of Revelation) said there was a rainbow around the throne, in appearance like an emerald. If you blend or mix the three colors of The Imperial Ethiopian Flag of His Majesty which are Red, Yellow, and Green, which also is the semblance of the rainbow, the blending of those colors give us a dark green color. Thus, appearance like an emerald. In regard to whether Ezekiel saw some sort of extraterrestrial craft or not. My view is more sublunary base (mundane), since Ezekiel (or the writers of the book) used one of the most compatible iconography of the middle eastern world to compared with that which he had saw in his vision. Therefore the imagery of the Babylonian and Assyrian "Shedu" or "Lamassu" was chosen, which either influence or became the Hebrew Cherub. The word "Cherub" has no etymology in the Hebrew language. Both the word and the concept is Babylonian, not Hebrew and remember Ezekiel was in Babylon when he saw this great sight. The word 'cherub' relates from the Assyrian and Babylonian "karabu," which means 'Mighty' or 'Powerful'. In the Bible a Cherubim is seen as an angelic being with the capabilities of flight. 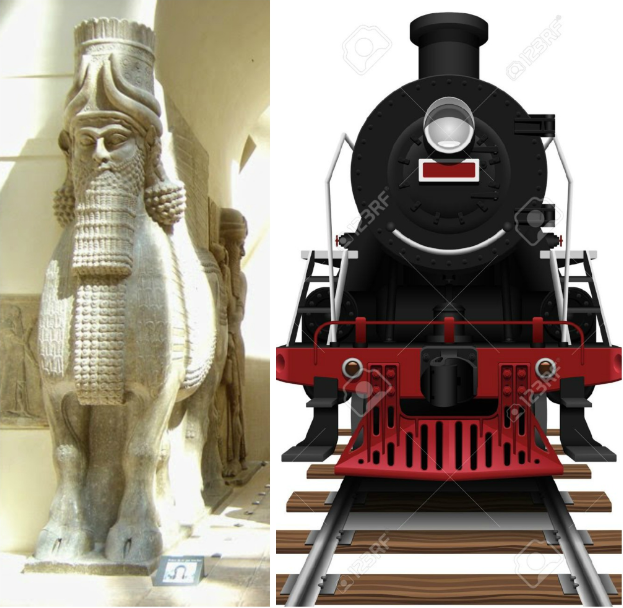 However, in Ezekiel's vision of God and his Throne-Chariot it symbolizes the Locomotive Steam Train which His Majesty used to exile Ethiopia. The Locomotive Trains of His Majesty was dubbed "Haile Selassie's Iron Horses" by the trains magazine in 1969. We must also keep in mind like the Prophet Daniel, Ezekiel was among the Jews exiled to Babylon who spoke about the restoration of the Israelites and their land. Therefore the theme of exile and restoration is also echoed in Daniel's vision regarding future events in reference to God and his People. Revelation 12:14 "And to the woman (Imperial Family) were given two wings of a great eagle (Steam Train & British Warship), that she might fly into the wilderness (Bath, England in Exile), into her place, where she is nourished for a time, and times, and half a time (5 years), from the face of the serpent (Fascist Italy)." The "two wings of a great eagle" symbolize the two means of transportation the Ethiopian Imperial family used to exile Ethiopia. The Imperial Family traveled by train to Djibouti in French Somaliland where they boarded the British cruiser HMS Enterprise to sail into exile. When deciphering the written account of Ezekiel's Poetic Vision in it's True Hebraic (Masoretic) form the truth becomes evident to see.